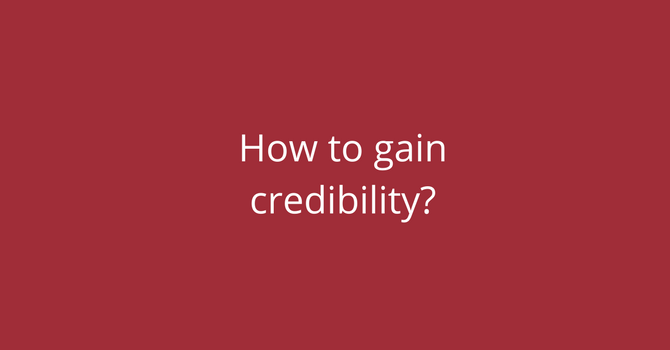 Do you think you need to prove your credibility? One of the pitfalls of presenting is focusing the content on you instead of on the message the audience needs to hear. Many speakers feel incompetent, uncertain or uncomfortable to give a presentation. This is not necessarily the case with every presentation, but it can occur for presentations responding to certain criteria. Depending on the person the criteria differ. It could be the size of the audience, the expertise of the audience, presenting on stage, the element of being recorded or live broadcasted, or the level of visibility of the presentation. There are a million good reasons to suddenly make ‘this’ presentation the one that will really challenge you. Observe what it is you do when you feel challenged. Do you think that you need to prove yourself to your audience so that they can trust your word? Do you think that you need to showcase your expertise? Do you think that you need to ‘look’ good? Thoughts like this will push you into some sabotaging activities. You will change to presentation’s content to put you in the focus. You will highlight more your own achievements and you will focus more on the ‘look’ of the presentation than on the actual message the audience needs to hear. This will all result in exaggerated visual aids like ‘funny’ pictures out of context, overloaded and complicated slides, and some swirling animations to pimp up the slide deck. Whatever it is, it is not necessary and only confuses the audience more than adding value. Last but not least, instead of raising your credibility, you are damaging it. Everyone wants to be seen as credible. I haven’t encountered one person whose goal it was to be seen as a fraud. So, we all have that in common. You do not need to prove your credibility; you need to deliver a message worth hearing, a message worth the valuable time of your audience. It’s that simple. The only way you will reach your goal of being seen as credible is when you focus the content of your presentation on what your audience really needs to know and indirectly you will be seen as credible.